Stephen Michael Drance OC FRSC (born 22 May 1925) is Emeritus Professor of Ophthalmology, University of British Columbia. 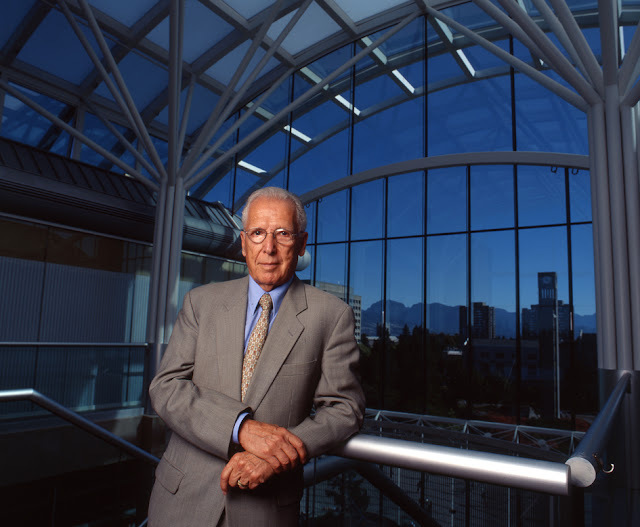 He was the head of glaucoma service at the Eye Care centre of Vancouver General Hospital, Vancouver, BC, Canada. Not mentioned in that Wikipedia citation is that Doctor Drance is a lover of culture and in particular that of music played with period instruments. He has been instrumental (through funding and other methods of support) in helping Early Music Vancouver be the successful organization that it is today. Doctor Drance is a low key and quiet spoken man whom I regularly chat with at Early Music Vancouver concerts. He always has a smile of delight on his face. Recently he told me that the University of British Columbia is planning in transforming the area around the UBC School of Music into an arts hub. I think this is a tremendously good idea and it cannot happen too soon. It is obvious to me that Doctor Drance is proud of being part of UBC and there is no doubt in my mind that he has contributed to its scholastic excellence. For many years I have cited the difference between the campuses of Simon Fraser University and that of UBC. Of the former you can actually get to it, drive under a little overhang and then leave the campus. It is that easy. UBC is more difficult. You might sort of drive around it but through it is pretty well impossible. There is one strong connection between the UBC and Simon Fraser University. UBC has a splendid library designed by Arthur Erickson. Simon Fraser was designed by Arthur Erickson and Geoff Massey. But there is another link that is not so obvious which to me is a tragedy. At one time Robson Square was a vibrant centre of our city. The Erickson designed complex with landscaping by Cornelia Oberlander was a marvelous piece of architecture. I remember fondly going to urban lectures at the beautiful Judge White Auditorium. Erickson himself would sit with the audience (some of us reclining comfortably on the carpeted risers on the sides) and ask pointed questions at Urbanarium Society lectures. I remember fondly all the arts presentations, films and dance at the Robson Square Media Centre. Even the Vancouver Film Festival had functions at the complex. I photographed Vincent Price in a press conference there. There was a restaurant on the plaza. Its name escapes me but they had tables on the plaza and people enjoyed being in the centre of things. The skating arena did not have a sponsor’s name and I went to several ballroom dance exhibitions on it during the ice-free summers. UBC took over the place. Judge White Auditorium lectures ceased. At one time UBC opened a bookstore. Is it still there? If the average person on the street is asked about a university presence within the city they will surely know about the Simon Fraser campus on what used to be Woodward’s. I attend concerts of the Turning Point Ensemble at Woodward's. There are many more cultural activities there. The university is surrounded by restaurant and watering holes. It is full of people. Robson Square is virtually dead. I remember taking photographs of Premier Bill Bennett in his office located there. The Premier’s office is gone. There would be an obvious link between the Erickson modified Vancouver Art Gallery and the rest of Robson Square. There is none. At one time Early Music Vancouver held concerts at the UBC Chapel (past the UBC Golf Course). I know for a fact that Early Music Vancouver could not get Vancouver City funding because the chapel was not within the city. It would seem to me (a purely personal opinion in what is materializing as my UBC rant) that when convenient UBC is not in the city and is part of the Endowment Lands (Spirit, etc in that name!). And when convenient they are part of the city in what really is another cemetery within our city’s borders. Thanks to Early Music Vancouver’s Summer Program (concerts and classes at the UBC School of Music, at Barnett Recital Hall) which just closed last week there is a hub of activity around there. You might have noticed people with large cases with theorbos inside or violin and cello cases. The place hummed. While attending concerts I made it a point to ask people when had been the last time they had attended a play or function at the nearby Frederic Wood Theatre. The answers were in years. My query if any of them had gone for an exhibition at the Morris and Helen Belkin Gallery recently was met by quizzical silence. Across from the School of Music is the Old Auditorium. This lovely place was refurbished but Doctor Drance told me that the sound is now not very good. But the place is the seat of UBC Opera. Because the city is now in charge of VanDusen Botanical Garden there is even more of disconnect among our cities excellent gardens like Queen Elizabeth and the Dr. Sun Yat-Sen Classical Chinese Garden. There is no interaction between them and the UBC Botanical Garden & Centre for Plant Research (and its ancillary Nitobe Memorial Garden. Few in our city know that the UBC Botanical Garden has a Shop In The Garden which houses an excellent small nursery. But anybody who might venture to UBC and explore Westwood Village they will find a modern and rather lovely (if made of concrete) urban development with a Save-On-Foods and even a yoga establishment. The people walking the streets (some with small dogs) are young. It’s a great little place. But it would seem that UBC is stressing urban development (or is that suburban?) that is slowly eating away at the trees and vegetation of the Endowment Lands. Condo towers are rising more and more. Finally with all the uproar of the recent and sudden (an unexplained) resignation of UBC President Arvind Gupta nothing has been mentioned by what I would call our lazy press on an event that I noticed last year while walking to a concert of Early Music Vancouver at the Chan. By the President’s residence I noticed several big and black SUVs and big men in black suits with ear bud and wires. I attempted to inquire what was going on but they told me to vamoose. Further up I asked a student who told me a body was found on the doorsteps of Gupta’s residence. Our press only added the information that the only person at home was one of Gupta’s daughters. Nothing was ever written on how the corpse (was it a man?) ended up on the doorsteps. Was it homicide? Was it a drug overdose? There has been nothing since. And our press has yet to connect the dots (if there are indeed any) on this event and Arvind Gupta’s resignation. Addendum: The name of the corpse is Roderick Bruce Cortner. To the above I would add that I also know the name of the corpses to be found on Robson Square. They are UBC.